Playing for Keeps tells the story of Keepsie Branson, a bar owner in the shining metropolis of Seventh City: birthplace of super powers. Keepsie and her friends live among egotistical heroes and manipulative villains, and manage to fall directly in the middle as people with powers, but who just aren't strong enough to make a difference. Or that's what they've been told. As the city begins to melt down, it's hard to tell who are the good guys and who are the bad. We will send Playing for Keeps to your Kindle at . 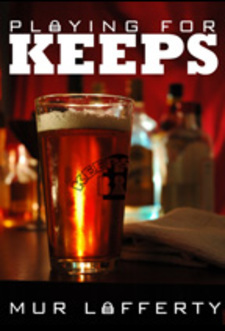 Playing for Keeps has been sent successfully to your Kindle!